What have you dug up this time? Yes, that's right. Referring documentation isn't entirely sure whether it was to have motorway restrictions placed upon it, although it does use the M13 designation. Oh, OK. What's going on then? The M13 is mentioned in documentation referring to the proposed Third London Airport, at Maplin Sands near Southend-on-Sea. Isn't that where the M12 was supposed to end up? However, big things were expected of Maplin Airport - and it was so big, that at the same time as the M12 was being mapped out, a second potential route to come on stream in the late 1980s was also mapped out. 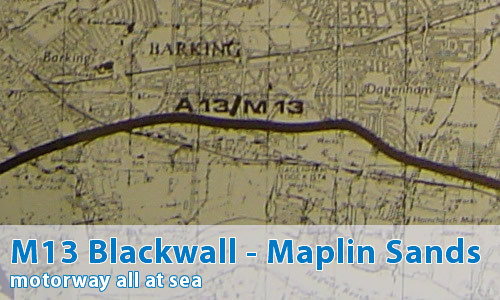 This was to take a more southerly course than the M12, following the A13 line out from Ringway 1, or the A102(M) East Cross Route, crossing Ringway 2 (M15), up until the route reached Rainham. The route would then have headed northeast, just missing Hornchurch Country Park, and crossing Ringway 3 (then M16, now M25) near Ockendon. It would then have headed south of Basildon, but north of Stanford-le-Hope, then south of Benfleet and Hadleigh. Finally, it would have bypassed Southend-on-Sea to the south before reaching Maplin Airport via the beach. Hang on a minute! Bypassing Southend to the SOUTH?? But...but...but... South of Southend, is, well, the sea!!! How on earth were they going to manage that one? I have absolutely no idea. Really, not a clue. It sounds as crazy to me as it does to you, but there we are. The following letter was printed in today's [2 May 2006] Guardian newspaper. This sounds like a very plausible answer to why one of the proposed M13 routes was out to sea! "Nine years ago a scheme for a millennium project for tidal energy for the Southend area was put to a government department (Barrage of support for tidal lagoons, May 1). Naturally, it was rubbished and I was told to contact Thames Water, although they are not our water suppliers. A sea wall with in-placed turbines and locks stretching from Canvey Island, skirting the end of Southend pier, and finishing at Thorpe Bay was proposed as a new toll road to ease traffic congestion. It would have been cheaper than the Pleasure Dome fiasco and provided work and ongoing benefits in this neck of the woods. If we use the "The A406 was built on the M15 alignment" analogy, then there definitely is one stretch of "M13 alignment" (albeit only four miles long) that HAS been built to D3 grade-separated standards, just like the A406! "What are you on about, Sunil?" I hear you ask. Well, you say that the M13 line was supposed to follow the A13 at the London end, right? But at the time M13 was proposed, the A13 dual carriageway between Ringway 1 and Barking had loads of traffic lights and "temporary" flyovers - NOT exactly a motorway or all-purpose expressway by any standards. And we agree that the M13 could have been built as an AP road. But hey, thirty years later we have nice new underpasses and flyovers along the four miles between Canning Town (A124/A1011 junction) and Barking, and UNLIKE the A406, there are no lane-drops except at (ironically!) the Beckton junction with A406 itself, which actually opened in 1989, 14 years before the upgraded junctions opened. Of course a major fault with the upgrade (its only one, mind!) is the prudish 40mph limit, dropping to 30 at Canning Town westbound on approch to the Docklands tunnels, but structurally at least, the 4-mile stretch is a very good piece of road, with even a couple of 4-lane stretches between junctions. "